The LTH incorporates the strong 3" diameter Rare Earth magnetic circuit used in our pneumatic inline Bullet Magnets into a unique housing for gravity/free-flow applications. The LTH has shown to be a significant improvement over traditional plate magnet applications, maintaining product flow rates by reducing product buildup and the associated downtime involved in cleaning the magnets. The LTH also revolutionizes the current practice of spacing grate/tube magnets further apart to maintain processing flow rates - a dangerous application which can result in a product of questionable purity. The new LTH offers increased product purity for a variety of gravity flow applications and unrivaled collection of contaminated metal versus traditional plate-to-plate magnet or "deep-reach style" purification. The design is simple. Gravity fed, contaminated products falls/flows through the housing and around magnetic tubes. 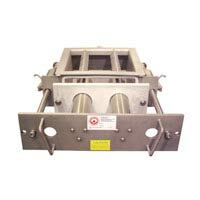 Metal/ferrous particles that are present in the product adhere to the tubes and the clean product continues to flow through the housing. The unit is available in EZ Clean and Self Cleaning models. The EZ Clean model requires an operator to unlatch the front door and pull out the drawer of tubes. As the tubes are pulled, they pass through seals that wipe off the accumulated tramp metal particles that fall into a catch pan. The Self Cleaning model works in the same fashion except the cleaning is solenoid activated and can be controlled from a remote location.